As a country India receives 5,000 trillion kWh of radiant sunlight on its landmass. Irradiation figures range between 4 and 7 kWh /day/m2, varying by location, across much of the country. Most parts of the peninsula enjoy close to 300 sunny days a year. Approximately 2,000 kWh or electricity can be generated per kWp of PV capacity with present cell efficiencies and just 3% of land mass it is sufficient to fulfill the net energy demands is covered with solar cells. India is only next to California in USA to receive the highest solar radiation equivalent of 5.5 kWh/m2 as depicted in the figure alongside. 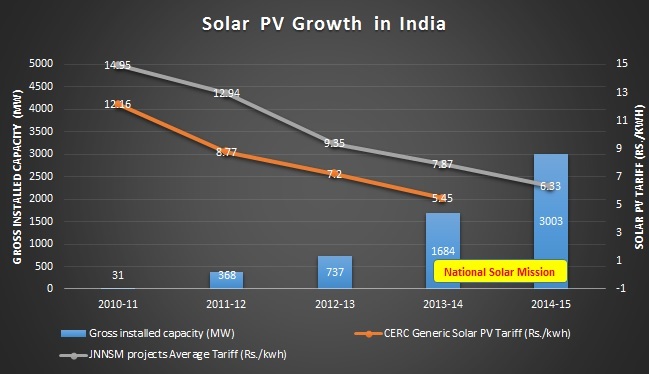 Until 2011 the renewable energy development in India was steadily moving with focus on incentive based market mechanism. However realizing the need for energy security and curbing emissions it made rapid strides by putting a significant focus on promoting renewable energy so as to achieve commercialization particularly wind energy and solar energy. The most prominent of them was the National Solar Mission targeting 20 GW of solar power largely photovoltaic (PV) and 20 million m2 of solar thermal area by the year 2022. The present revised target for solar PV stands 100 GW and solar thermal has the potential to achieve 50 million m2 respectively. 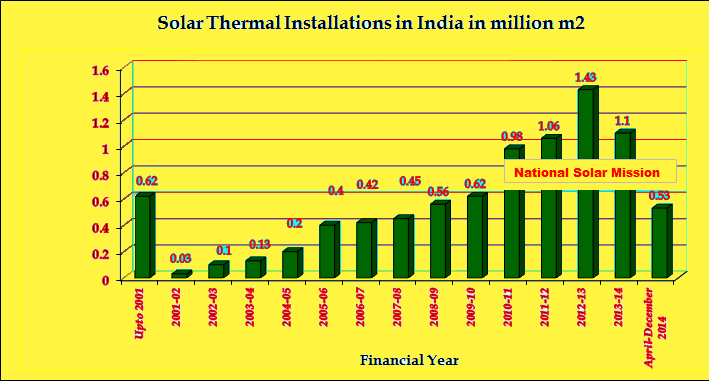 India’s solar thermal development is globally acclaimed and presently stands amongst the top five nations including China, Germany, USA and Turkey. The solar water heater market development is the second most aggressive globally as per our findings since the past 12 years. As per the Ministry of New and Renewable Energy (MNRE), government of India, the estimated technical potential of Solar thermal energy in India is 140 million m2 of collector area. As much as 70% of India’s population is involved in agriculture and lives in rural areas. Upwards of 400 million Indians have no access to grid electricity and an estimated 80,000 villages are not connected to the grid. Solar PV therefore, present an enormous opportunity in rural and remote area for electrification needs.